Configuring PE Explorer. Customize PE Explorer The Way You Want It. PE Explorer has a set of options controlling the general settings and the look and feel of the interface. The settings can be selected by first moving to the menu bar and clicking on View, then selecting the menu item Customize. This displays a dialog box having three tabs along its top edge, where you can customize the general, font/color and logging settings. Clicking on any tab will show the page of choices connected to that tab. 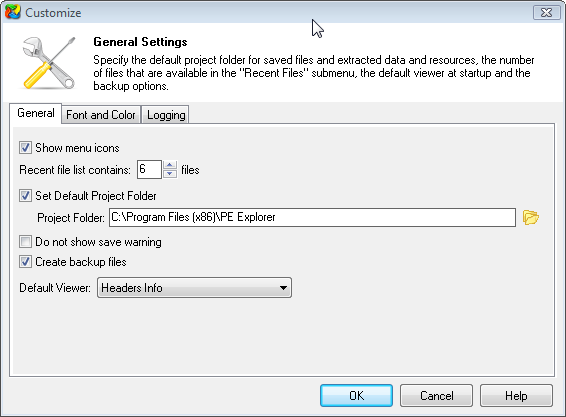 This lets you specify the default project folder for saved executable files and extracted data and resources, the number of files that are available in the Recent Files submenu, the default viewer at startup and the backup options. 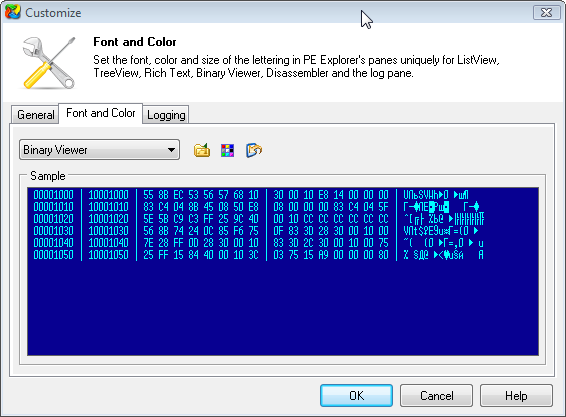 This lets you set the font, color and size of the lettering in PE Explorer's panes uniquely for TreeView, Binary Viewer, RichText, Disassembler and the Log Pane. 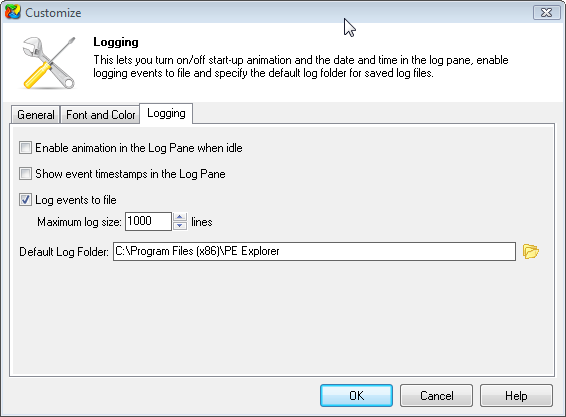 This lets you turn on/off start-up animation in the Log Pane and configure the activity log and how it is displayed on screen (turn on/off event timestamps), enable logging events to file and specify the default log folder for saved log files.